Forstner Bits -- Amazingly versatile, they�re the world�s most unique bits! 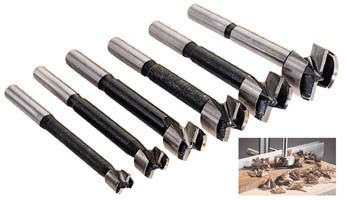 Forstner bits are designed to handle tasks that other bits just can't tackle. First, they have practically no center spur, so they�re ideal for boring almost perfectly flat-bottomed holes like those found in holders for candles or salt and pepper shakers -- or hollowing-out small, circular boxes for rings, jewelry, etc. Thanks to the small spur, you can use most forstners to drill to within 1/32-inch of the bottom of your workpiece without fear of the center spur chewing through the wood. They're also great for boring exceptionally clean angled holes or overlapping holes; for re-locating an existing hole by enlarging it; for making round-end mortises; for drilling into end grain; and for drilling larger diameter holes in extremely thin stock, such as veneers, without splitting. Furthermore, because of their unique design, they won't "wander" off center... even through knots, bird's-eyes, and irregular grains. In short, they do all the things most bits can't do. Available in four individual sizes or a complete set for additional savings. All bits offer a 5/16-inch shank. Each is 3-1/2-inch long overall. Definitely, the most versatile and convenient drill bits you could ever own!